i) the multi-drum test (section 10.3), which simulates the wheelchair rolling over small obstructions, and ii) the drop test (section 10.4) exposing the wheelchair to a sequence of falls, simulating passing over curbs and small steps. 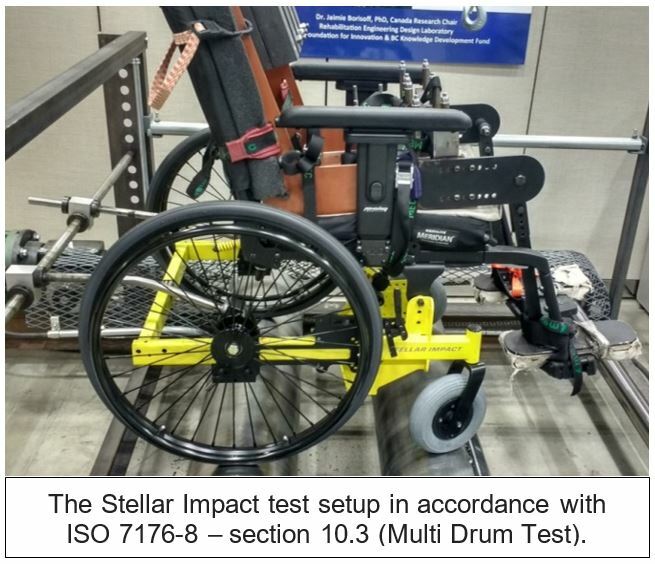 To fulfill the minimum requirements of ISO 7176-8, the wheelchair must endure 200,000 cycles of the multi-drum test followed by 6,666 cycles of the drop test using a test load at the maximum occupant weight capacity. The Stellar Impact, like all other PDG chairs, had to be set up and tested in accordance with these ISO 7176-8 requirements. Once multi-drum test was completed, the same Stellar Impact was set up on the drop test rig where it was lifted and dropped from 50mm 13,332 times, which is twice the minimum requirement. These fatigue test results show that the Stellar Impact not only fulfills but surpasses the minimum requirements. 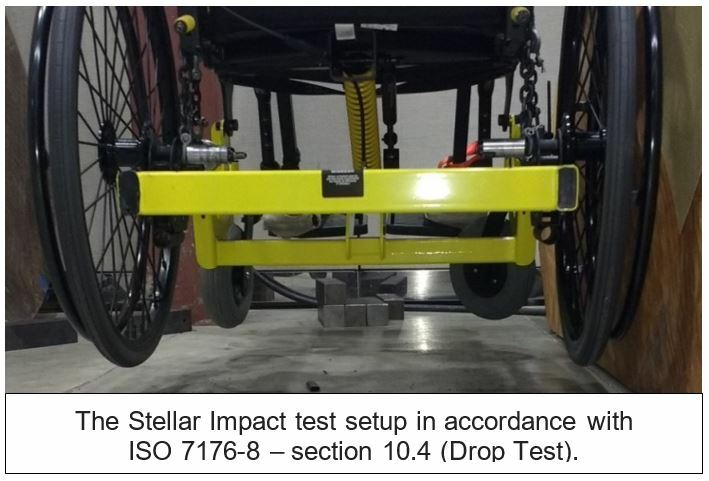 The wheelchair chassis was in good condition, showing no signs of damage, cracks, or deformation, supporting our claim that the durability and strength of the Stellar Impact 45° Tilt Wheelchair are unmatched. Stellar Impact test performance with 286 lbs test load.